Hello Couchers! Welcome to the 89th edition of Tuesday Couch Potatoes. Wow, I can't believe we are already on the 89th. It's that fast, huh! I think I'd better get ready for another giveaway. Please watch out for the giveaway announcement which I will be posting soon. Last week, we had Fashion Movies and film The Devil Wears Prada seems to be the favorite pick among the Couchers. I wonder which film will make to the Top Pick for this week's theme: "Iconic Hat". 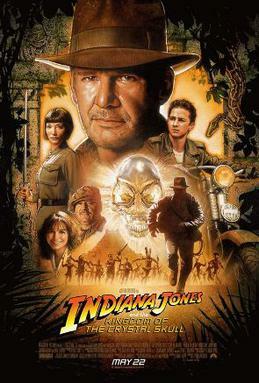 My pick for this week is Indiana Jones and the Kingdom of the Crystal Skull. Yes, we are all familiar with Indiana Jones' hat and it has become one of the fashion statements to be wearing a cowboy hat just like the ones he is wearing. People would automatically connect the hat with the movie so that it has become an icon. I enjoyed this movie for it's being very adventurous and mysterious, as usually the case with Indiana Jones movies. I loved it because it's from George Lucas and directed by Steven Spielberg. You can also compare how much Harrison Ford has matured and aged since his first appearance as Indiana Jones in the Raiders of the Lost Ark back in 1981. Thank you for joining us this week here on TCP everyone! I hope to see you all again next week for another movie feature with the theme: "It's Complicated", movies about love and it's complications. Yay haven't seen this movie yet. But this is a nice choice for the week's theme. love this! and all the Indiana Jones films, lol!